If you’ve ever read any of my previous posts, you know we spend a lot of time in North Carolina. It’s a community called Lake Toxaway, and it’s a beautiful, turquoise lake at the top of a mountain. We found it 7 years ago, when we stayed at a resort called The Greystone Inn. Over the years, we’ve stayed there several times, then we started renting homes, and finally, last summer we bought a little place of our own there. We don’t get there as often as we’d like, since H is so busy at school, but whenever we can get away, we’re there. Last week, while H was in Washington, DC, on a school trip, we spent the week there. It was so great. Our dog, Rosie, was in heaven. We hiked every day to a different waterfall, went mountain biking up Cold Mountain Road, swam in the lake, and J tried to teach me to golf. Not a pretty picture. He only let me use a 3 iron, and a putter. I teed up in the fairway, and still embarrassed myself. We ate dinner on night at the Greystone, and I ordered this cream of potato and leek soup that I didn’t think I’d like (I don’t like creamy soups…too fattening), but ordered anyway because it came with the meal. It was so great I ate it all, and asked for the recipe. To my surprise the “cream” came from blending up the potatoes and leeks…it was a broth soup, and only had a tablespoon of olive oil in it! Don’t pay any attention to that description. It was phenomenal! I made it tonight, and J and H loved it. It’s super easy, too. Heat oil in a large saucepan over medium-high heat. Add leek; sauté 5 minutes or until tender. Add potato and vegetable broth; bring to a boil. Reduce heat, and simmer 25 minutes or until potato is tender. Place 3 cups of potato mixture in a blender. Remove center piece of blender lid (to allow steam to escape); secure blender lid on blender. Place a clean towel over opening in blender lid (to avoid splatters). Blend until smooth. Return pureed mixture to pan; bring to a simmer. Stir in salt and pepper; cook 2 minutes, serve warm. Garnish with chives and croutons, if desired. Hi. What a fine gourmet blog. May I link this into http://berenjit.blog.com/ Take care. 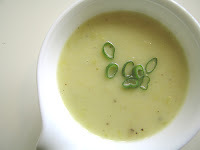 Mmmm…my dh is not into creamy soups either but I may have to make this for myself! Thank you!